As per the latest new the government try to explain to all the businesses that they not to wait till the last day to file GST returns. Still 11 lakh still not yet to completed his registration process. Only Fifty percent registered taxpayers have to paid his taxes on till date. All we know very well about the importance of the GST in current financial year. GST stands for Goods and Service Tax. It is a one tax which is applicable on whole nation. As per the Revenue Secretary Mr. Hasmukh Adhia Government has been flexible to demand of the industry. Now it’s time for the businesses to do that. As per the news only 44 lakhs out of 72.5 lakhs have to pay his taxes. Approx 11 lakhs person still not finish his GST registration process. As per the GST network send warning message to charge penalties for all those who are subjected to GST but yet not registered. As per roughly idea GST tax criteria has been increased up to 30 percent. Approx 21 lakhs new registrations has to be done under the GST system. At this time there are 6 crore private business enterprises in India which indicate to increase the criteria. 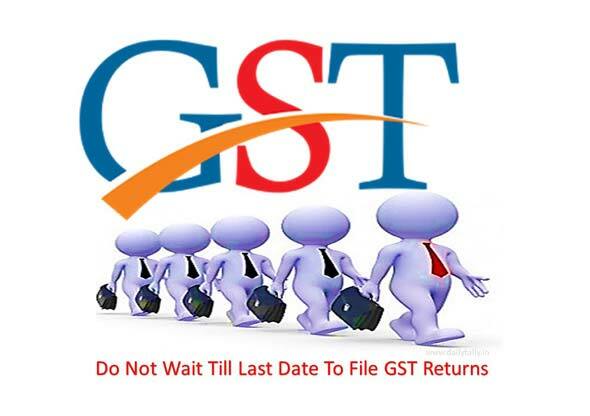 Government increase the time limit to fill the GST return in the beginning of this week. Now you can fill latest sales return or GSTR-1 up to 10th September for the month of July. Before this news the last date to fill the GST return is 5 September in India. You can also file Purchases return or GSTR-2 up to 25 September at the place of 10 September in the country. This news gives a great relief for all those businesses who forgot to fill the return. Now, they get chance to get the relief to pay the penalty or late fee charges. Mr. Adhia also clarified to all the businesses who are registered under GST. These businesses need to file the GST return before the last date. If they have not transacted any business they have to pay late fee.